Here at the studio we are very excited about our Spring '18 collection! We have added new elements to the line and look forward to seeing how brides rock these pieces at their wedding days to come! 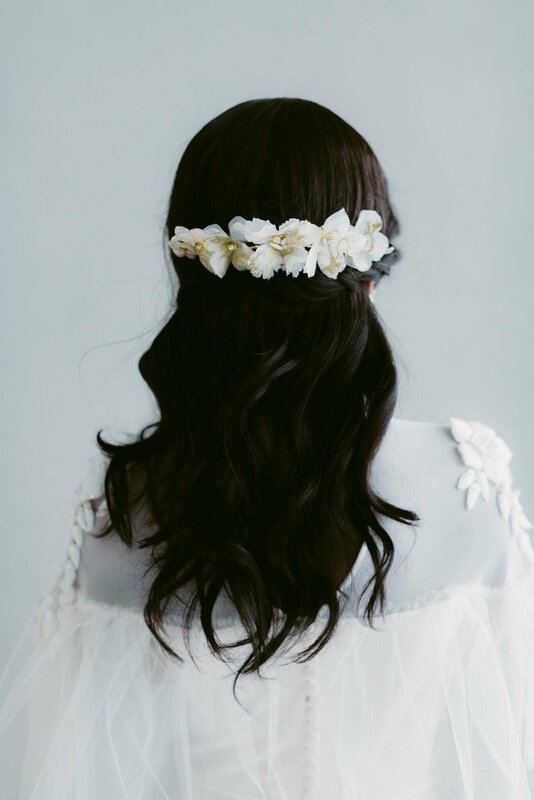 When starting to search for the perfect accessories for your big day sometimes it can be tough to know where to start. We are here to help by breaking down Thea's top picks from Spring '18 just for you! First up is the Kenzie Earrings! These are just one of the many new laser cut earrings we have added to the collection for the season. Kenzie is great because it is a wedding day READY... or perfect for your post wedding brunch! The Kenzie earrings are also fun for everyday or a night out, the clean minimal lines and just a touch of gold & crystal compliment any outfit. *Can be worn both facing inwards or outwards. Katie is our new marbleized floral tiara - that can be worn both on the top of your head or at the back under an updo or gibson roll. We are having so much fun with this new marbleizing technique! We love it on this piece because it is a tiara that incorporates florals but still feels super modern, easy and fresh. Here at the Hushed Commotion studio we are always looking for the perfect mix of textures within pieces. 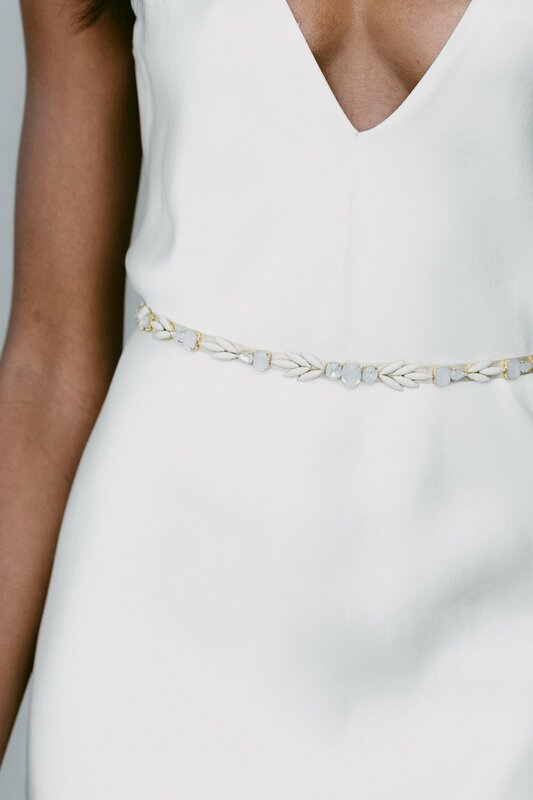 Brides as of lately really love subtle details that are still super special. The Heather belt from Spring "18 is the perfect combination of just the right amount of finishing touch & sparkle with these new irridescent crystals! For this collection we added two veils with custom HC embroidery! 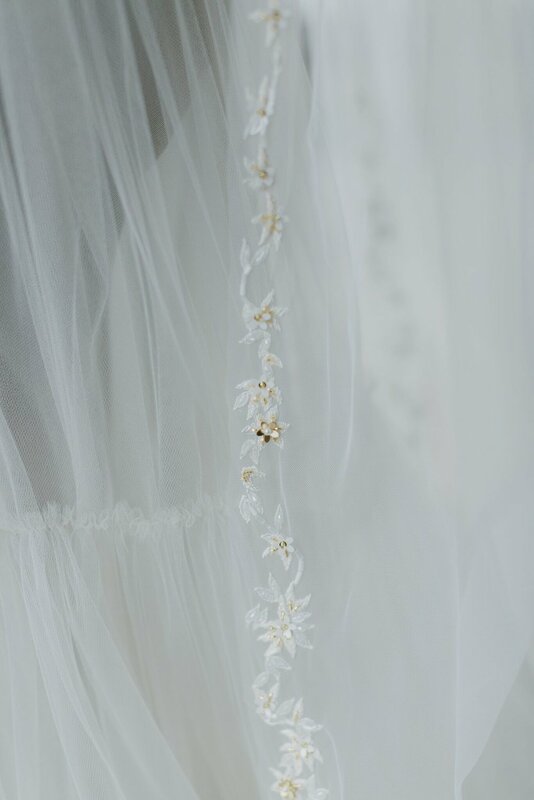 We love the Gavrielle veil for it's ivory floral detailing with touches of gold. This veil combines what we love about traditional bridal with the elegance that's the right fit for a modern bride. Our new James headband with gold speckled tulle is literally Thea's favorite obsession and she is probably wearing it right now as she responds to your inquiry email! This turban inspired headband is perfect for getting for your big day or to wear while you dance the night away. We also offer it in black and a full range of other fun colors! Let us know what your favorite pieces from the collection are! Earth Day: What we do here at HC to support the cause!